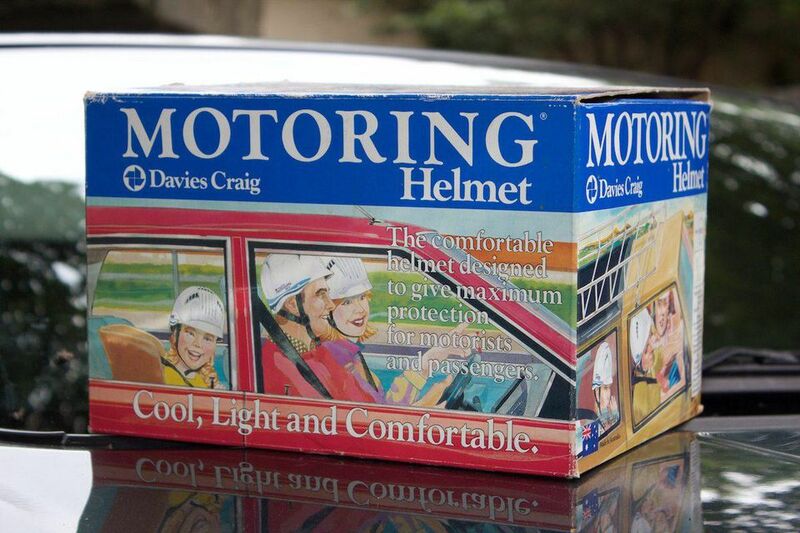 Motoring Helmets Don’t Sell, So Why the Bike Helmet Hysteria? The data are clear. People in motorized vehicles suffer far more head injuries then bicyclists. Find just a few of the charts available here. 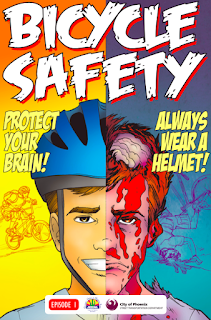 Over my many years of pushing back against overzealous bike helmet promotions, I’ve enjoyed suggestions by level-headed people that car occupants should wear helmets before any more bike helmet promotions or laws are allowed. That was always an amusing and soothing concept for me. 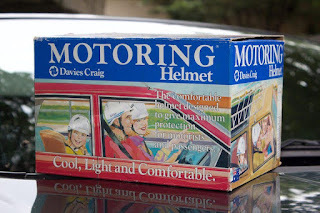 But I had no idea that motoring helmets were ever actually manufactured. This recent article in Forbes by Carlton Reid, a very level-headed author and bike advocate, reveals the stunning attempt by an entrepreneurial car parts manufacturer to sell motorists on the safety of wearing their helmet while in a motorized vehicle. Over three years, they sold a paltry 500 helmets. Carlton actually found one of those 500 and bought it on eBay. Every selling point they made matches the points used by bike helmet pushers. And they had so much more evidence backing their claims. So why has our society worldwide, with rare exceptions like the Netherlands, bought into the bike helmet hysteria so blindly? My thought while reading the article was that the car industry was never silly enough to push motoring helmets. Come on, why would they make their product seem dangerous? Duh. But wait, the bike industry readily pushes bike helmets. Doh! Carlton’s article is a great read for many other reasons beyond the motoring helmets. Enjoy. But really, someone actually made a motoring helmet? And it did not sell. That is a whole new data point for me. Thanks Carlton. Over the years, there have been noteworthy attempts by journalists and media channels to capture the problem with bicycle helmets. Most will fixate on one particular element of the problem such as scaring people away from cycling or police harassment. Others will make a gallant effort to touch on all the concerns, usually in list form. Unfortunately, the one thing that most of these articles, news clips, and videos have in common is a concluding plea for cyclists to always wear a helmet, as if they hadn’t paid attention to what they had just presented. Today I was pleased to find an exception to this rule. 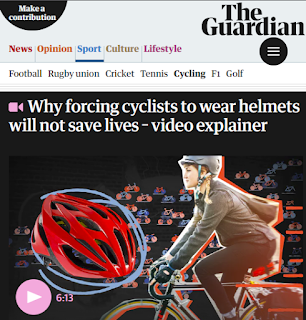 This video from the Guardian does a good job of explaining a few of the main concerns about bicycle helmets. But most importantly, it ends with the very real point that car occupants suffer far more head injuries than cyclists. The final plea is not for cyclists to wear helmets, but for car occupants to clad their heads in Styrofoam instead. Well done! I’ve worked with bicycle advocates all around the world who are pushing back against rampant bike helmet promotions, most of which lead to threats for mandatory helmet laws. This blog touches on many of these cases with articles labelled Fraud & Deception. I take pride in all these efforts and yet I live in the most helmet-obsessed country in the world. That can be tough at times as I see too many horrific bike helmet promotions to even respond to, including the one pictured here from the nearby city of Phoenix. So embarrassing as an Arizonan and so horrific as a bike advocate to imagine the terror of bicycling this image caused in so many kids. 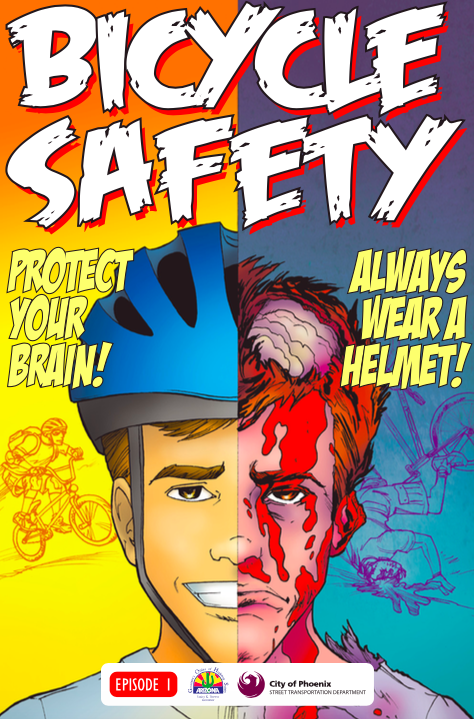 In the United States, official bicycle safety messaging heavily emphasizes helmet use. In a way, it’s worked: American rates of helmet usage are high. But by almost any quantifiable safety metric, the helmet fixation has failed. People bike at low rates in the U.S. compared to international peers, and suffer higher injury and fatality rates per mile of cycling. Read the rest of the article here. Great read! 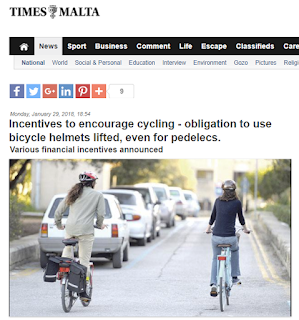 Just two days ago, the transport ministry of Malta announced their repeal of their mandatory bicycle helmet law as part of a package of incentives to increase bicycling. This is fantastic news, not only because it adds Malta to the growing list of places repealing these harmful laws, but because Malta’s officials have recognized the harm their helmet law had caused. This makes Malta an excellent example for other places – cities, regions, and nations – also considering repealing their mandatory bicycle helmet laws. A series of initiatives to encourage the use of bicycles was announced on Monday by Finance Minister Edward Scicluna and Transport Minister Ian Borg. Listed among them is the removal of the obligation of using a bicycle helmet, especially when renting pedelecs.